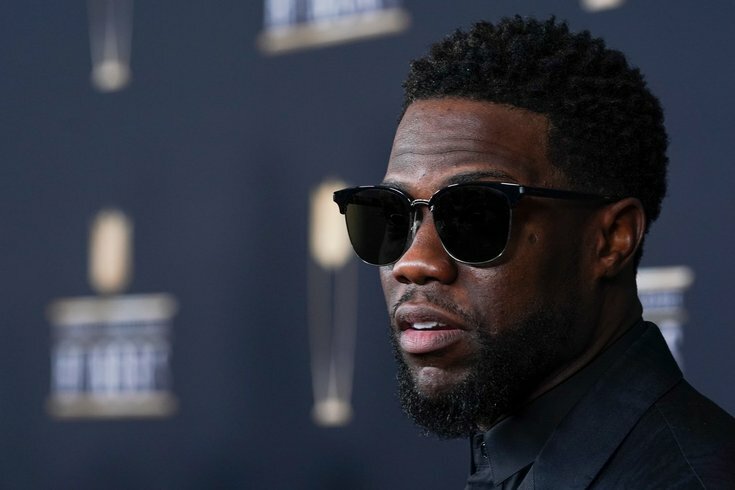 Native son Kevin Hart makes news in Philadelphia pretty frequently, whether he's hanging out with Joel Embiid, getting banished from the stage at the Super Bowl, or becoming the first comedian ever to sell out an NFL stadium. Last year, Hart filmed a starring movie role in his hometown for the first time. A remake of the popular, Oscar-nominated 2011 French film "The Intouchables," the film was about an ex-con (Hart) caring for a quadriplegic man (Bryan Cranston). The movie went by various titles at different stages of production, including "The Untouchables" and "Untouchable," before eventually going with "The Upside." "The Upside," which co-starred Hart and Cranston and a cast that included Nicole Kidman, Aja Naomi King and Julianna Margulies, was filmed locally for several months in early 2017, although some scenes were shot in New York. "The Upside" premiered last fall at the Toronto Film Festival, where it received mixed reviews, giving it a 55 percent Rotten Tomatoes score based on 11 reviews. That festival, more than seven months ago, was also the last time anyone has seen the film. "The Upside" was scheduled for a release March 9, but that didn't happen. And that's because the studio behind the movie pretty much no longer exists. "The Upside" was produced by The Weinstein Company. But when company founder Harvey Weinstein was accused by dozens of women of sexual abuse and harassment last fall, it led to his ouster from the company. In addition to the launch of the #MeToo movement and the repercussions of Weinstein's many other alleged misdeeds, the scandal put the company itself – as well as various films on its release slate – into limbo. Some scheduled Weinstein releases – like January's surprise hit "Paddington 2" – were sold off to other studios. An entire slate of films was pulled from the calendar, including "The Upside," which formally lost its release date in January. In response to the reports, some Weinstein Company partners fled and the company has been struggling financially, with bankruptcy proceedings reportedly possible. In recent weeks, various deals to sell the company to new ownership have come together and fallen apart, one of which would have left a female executive, Maria Contreras-Sweet, in charge of the studio. The most recent version of the deal collapsed last week, and it's hard to imagine the fate of "The Upside" coming into focus as long as the sale remains unresolved. Amira Smith of the Greater Philadelphia Film Office said the organization has heard nothing but "radio silence" about when "The Upside" might get a release, and if anyone would know about the status of a Philadelphia-shot film, the GPFO would. "All I know was it was set to release in March  and was expecting it to start promo as soon as the new year came in, but it's been radio silence," she wrote in an e-mail. "We've received no updates at all." I have got to say one of the funniest comedians in the business did a movie called The Upside and I have to say it's going to be a masterpiece. I'm not saying this because I'm in it with @KevinHart4real @BryanCranston I'm saying it because we won't get a chance to see it. Clearly, the fate of one Kevin Hart movie is far from the most socially important factor, nor the most pressing matter, to emerge from the horrors of the Harvey Weinstein scandal. But the film did utilize the labor of not only a favorite-son movie star, but numerous background actors, casting directors, crew members, caterers and all of the other local professionals who plied their trade on a local movie set, at a time when jobs doing so aren't as plentiful around Philly as they once were. Hopefully, the work of all of those people will see the light of day sometime this year.